Did I also tell you I gave up coffee 42 days ago? No? Well, I did and what an absolute crazy idea that was. I know I've mentioned it here before but I LOVE coffee, it is my daily pleasure, my love, my sanity, my pure golden joy ... I LOVE THE STUFF, and I miss it every flippin' day. But, I am persevering with my break and am really just seeing now how long I can go without caving. I feel it will be soon. Anyway, I needed an alternative. I needed a frothy hot drink to soothe my heart and mind. I decided my saviour would be Chai Lattes - they are frothy, they are hot and they are yummy, mostly. I started buying one almost daily, and I was enjoying them, but I found that almost all of them were way too sweet and I never actually knew whether it was "real" Chai or just some pre-mixed, additive-loaded guk. I had an ingenious idea. I would make my own Chai. 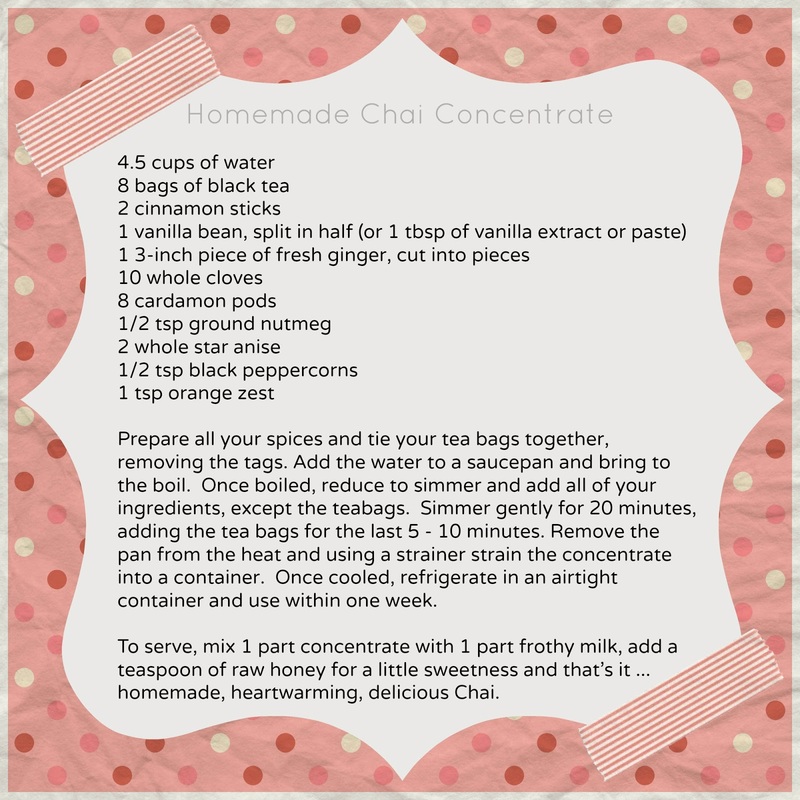 I Googled for a recipe and I discovered that actually everyone was making their own Chai, it was easy and my idea was not ingenious afterall. I needed a coffee after that little let-down ... but I stayed strong. I looked at quite a few recipes but ended up using this one from Tasty-Yummies, I just adapted it to suit me. I left out the sugar, did everything in a pot because I don't have cheese-cloth laying around, and I added the tea bags towards the end - I thought it might be too strong having the tea bags simmering for 20 minutes. It really is very basic to make and because you make a big batch at once the leftovers go in an airtight container or bottle in the fridge ready for tomorrow's cup. I actually made enough for about 5 cups so I was good for the week, plus I have enough left over ingredients to make it again, and again. But the very best thing is, it tasted great, like real Chai, not too sweet and I know exactly what's gone into making it. I am still missing coffee but I have found Chai to be a very close second. One of my favourite things to do is make up necklaces for my little girl - they don't always work out but I just find the process fun, cutesy and soothing. I had ordered some little crocheted wood beads to make flower necklaces for my daughter's birthday party, as favours for her friends, but the beads were coming all the way from Latvia (I know that sounds dumb but you know what Etsy's like, you just get carried away and end up buying beads from Latvia!) and didn't arrive in time for her party. I decided to make one for her and, lo and behold, it turned out. I actually love it, and did I say it turned out? The beads are held together with hot glue which gives the flower a bit of flexibility - always important when a 3 year old is tearing wearing it - and I sewed a jump ring (I think that's what they are called, a little metal circle) on the back and threaded through some satin string. I think it's so pretty. What do you think? I also participated in a really fun little challenge called "The Creative Exchange", where I was partnered up with a fellow creative on Instagram, and after stalking them on Insta and Facebook, I packaged up a little box of treasures for them, suited to their likes and interests. Someone will be doing the same for me. Do you get it? Basically it's love in a box, from a stranger. How cool is that? I'd better not say who my exchangee is, in case she's still stalking me, but she has an obvious love affair with cookies and so my love box was made up of a handmade tea towel apron (oh my goodness, this is such an easy pattern, and so cute! ), a pink spatula, a heart cookie cutter, a star cookie cutter, "You're One Smart Cookie" stickers (to be added to gifts), some pretty recipe cards and a cookie tin. I really hope she likes it. The Creative Exchange was hosted by the lovely and super talented Sam at Dunne with Style. Thanks Sam - it was a whole lot of crafty fun! The crappy looking wooden spoon and the pink spatula were not part of the gift - they were just for modelling purposes! And last but not least (well, actually, it probably is least), I was so very excited when my gorgeous little furry felt balls arrived on my doorstep that I dived into making something for my daughter's bedroom. I wanted to make a felt ball covered heart to hang above her bed, it was going to be adorable, it was going to be charming, it was going to be made with love ... well, it was at least one of those things. It didn't turn out as I imagined and if I could've been bothered I would've pulled it all apart and kept the balls for another rainy day. Instead, I showed my daughter, she said it was "coot" so I hung it on her wall and left it at that. It is made with love and she calls it "her love" so that's enough for me.